Have you ever been out on our marine mammal safari on earth day? Although we didn't have the best weather we had the best crowd coming out to join us on our fun event. 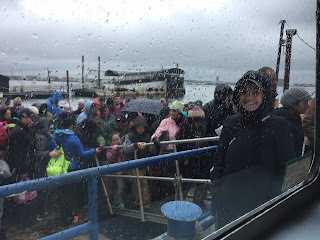 Personally I thought we weren't going to see any seals, porpoises or birds but, it turns out that we did, we got to see every single last one of the animals we told our guests what we were going to see. Once I got on the boat I was feeling little sea sick but then got the hang of it because believe me the last time I got on a boat was last summer with Save the Harbor and man! Has it been a while. I remember talking to a woman who was telling me she was sightseeing at Castle Island and spot something that looked like a dolphin and she quickly pulls out her phone to show us what she was talking about. She said that she only stayed because maybe it got lost and was in need of help but in a blink of an eye it was gone. I had to break the news to her that it couldn't have been a dolphin especially during these types of conditions in Boston. However I did tell her that it could've been a porpoise. So I told her to give give me a minute to go get her one of our facts sheets dedicated to porpoises and sure enough the pictures looked IDENTICAL! Unfortunately I didn't get any pictures of our beautiful birds or porpoises I did however get the pleasure to finally get a seal in action peeking his or her head out. Did you know that seals have long necks to catch their prey. I don't know if the seal saw something or just relaxing... or maybe even posing for us but whatever it was doing I was glad all our guests left on a good note from seeing it. So this is how the story goes, on our way back some spotted a seal not too far from the boat. It was literally a swim or two away from us and it was awesome see it poke its little head up. And for most of us we often don't believe that there is much in the sea but guess again theres ALOT! I remember being inside the boat to freshen up a little when I seen the crowd rush out to the second level and most ran to the window that I was closest too. All you heard was excitement and immediately everyone took out their devices to take pictures/ videos of the seal. It was definitely quite an experience to see all or wonder mammals.The best part for me was being able to get off the boats and seeing smiles of all the younger wonder children who had had and the adults who had never seen any of this before. Have to admit it was pretty cold but hey better days are coming soon. 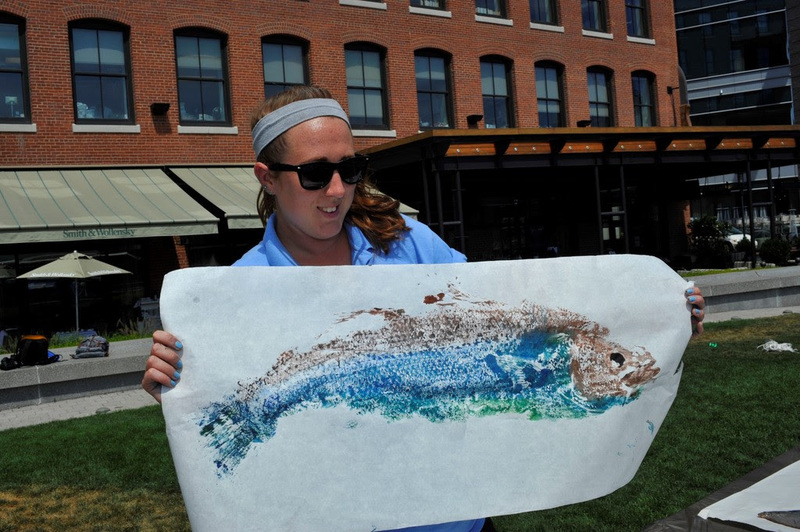 Fish Printing at the Wharf! It's been awhile since I've written here and I honestly can't wait til the summer to go fishing and to do more fish prints at the Beach Bash Events because those were honestly the best. Over April vacation I had the opportunity to do two events at the Atlantic Wharf and at first I was pretty nervous because it's been awhile but I got those fishing rods and that scent of flounder and I knew I was back home.The first group of kids were from the YMCA and they were freezing but we motivated them to fish and to see if they could see any fish in the water but sadly there was none and I told them they were resting and that they'd come back when it was warmer. It was also different because I finally got to meet Larry the Lobster who was pretty amazing and the kids were so scared because they thought he would "bite" them but I let them know that his pincers were tied together and that nothing would happen to them. When the next group of kids came there was Tony the Pirate who would tell them hilarious stories and show them his gold and as they listened many kids would come to the table where I had a flounder fish and kids would try to see what kind it was then they would make fish prints and they all looked so beautiful. I honestly can't wait til the summer so I enjoy the views and go to all the sites especially Carson Beach because it's like family and you get so used to seeing the same faces and enjoying the weather! It was April vacation, and spending it on the Harbor was a great way to spend the week. On Tuesday I had the chance to spend my day at Atlantic Wharf with the YMCA. It was a cold day but we still managed to have a fun time. Inside, we set up fish printing stations where each pair of children had the opportunity to create a fish print. For many of them it was their first time fish printing. I don't know what they liked more, actually making a fish print, or touching a real fish for the first time. After making fish prints, the group headed outside for a chance to cast some rods and crab traps into the harbor. For many of them, just like fish printing, it was their first time casting a fishing rod. And everyone had a chance to meet Larry the lobster! It was another exciting day with the young explorers on the harbor. There was so much interest in learning and happy faces throughout the day. And I am glad to have had the chance to spend my day with the YMCA. 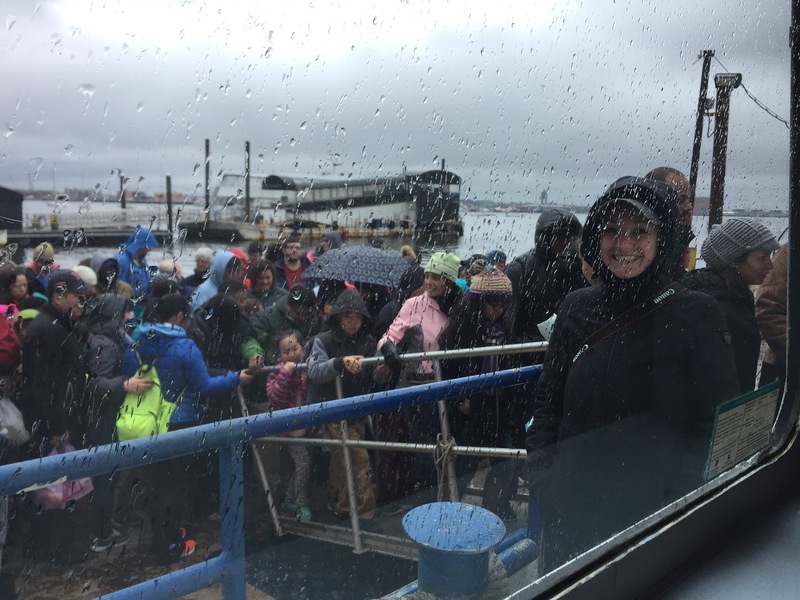 On Saturday, we held our Marine Mammal Safari on the harbor in hopes of seeing harbor seals and porpoises. As we took a tour around the harbor, many of the harbor seals decided to make many appearances, exciting all on lookers on board. Hey Justin! It was a pleasure showing you many parts of Boston while on the cruise. Only living In Massachusetts for 2 years after moving from California, it was a day of many firsts for yourself as well as little Eli and Avery. 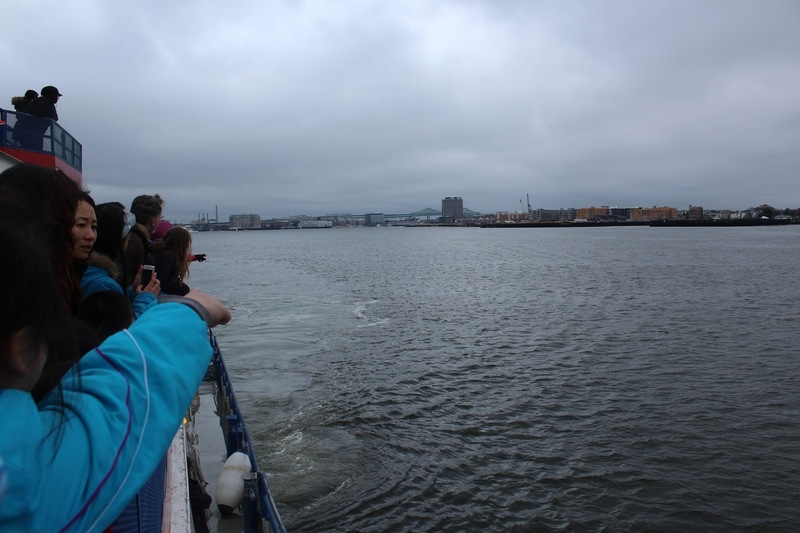 While taking pictures of porpoises, Eli was thrilled that he was on a boat for the first time, as well as getting a chance to take a picture of TD Garden while on the tour. He was ecstatic when he found out that the Boston Celtics played there. Although the weather attempted to put a damper on our day, we made the best of it seal watching. Everyone enjoyed their time and I hope to see Justin, Eli, and Avery again for another exciting time at Save The Harbor. Until next time, and keep on exploring, Preston. I am pretty lucky. 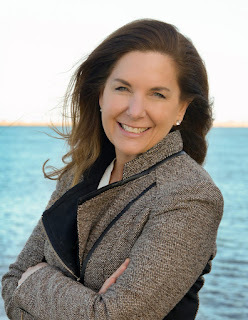 10 years after my last job working on the Harbor, I am given the opportunity to become Save the Harbor/Save the Bay's Vice President of Operations & Programs. 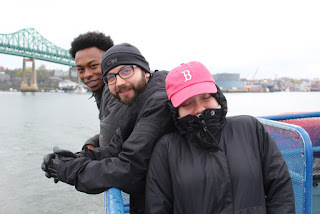 One of my first duties is to join my (insanely knowledgeable) new co-workers, returning Junior Program Assistants from our summer youth jobs program, and the crew and captain of Massachusetts Bay Lines on Save the Harbor's annual "Marine Mammal Safaris" this past Earth Day. It's one thing to know in your mind that Boston Harbor, once a sewer and source of shame for our city, is now home to the cleanest urban beach in the country--something only possible because of the actions of thousands of people over multiple decades and a $5 billion public investment in the Harbor itself. It's another thing all together to stand on the deck of the "Freedom" and see proof of that in the form of dozens of porpoises diving (or porpoising) through the water, and harbor seals circling our boat. And the only thing better than seeing it with my own eyes for the first time? Hearing the literal "oohs", "aahs" and giddy gasps of excitement from over 200 people as they see it with their own eyes for the first time. I have been involved with environmental education and awareness programs for most of my academic and professional life. I've shown land-locked students from Brooklyn live seahorses living blocks from their school; I've helped middle schoolers grow their own vegetables in former brownfields. But never have I seen and heard the pure, unadulterated amazement of people realizing they rode the T to a free boat tour and be practically within arms reach of the kind of wildlife they had only pictured in some distant sea, off the coast of California or in a Florida theme park. And this all happened on a chilly, rainy Saturday when most people would have looked out their window and opted for a cozy day at home. On our third trip of the day, as my forgotten geography and knowledge of Boston from the water started to trickle back into my brain, the rain started to fall harder. We had been out for over an hour and had only glimpsed a distant dorsal fin near South Boston. We had ducked in and out of Chelsea Creek, around Charlestown and up to the mouth of the Charles River: all the hot spots we had been spotting marine mammals since 9am that morning. But at 1pm, 300 damp people were starting to get restless. We had touted a harbor full of sea life that we had witnessed all morning. We had promised them a slew of cetaceans. And yet here we were, headed back toward Rowes Wharf on our final trip of the day with not much to blog about. Which is exactly the time when our Captain, Tim, suggested "you know, we've got an ebb tide here, and it could be all the food is heading back out into the harbor. It could be why we've come up short so far. Let's try one more thing." I swear that's a seal . . .
Now, the sun didn't literally break through the clouds at that moment, but that is always how I'm going to remember this day. With only a few minutes until we had to be tying up at the dock, the Captain motored back out along the South Boston waterfront, and dead ahead, at 12 o'clock off the bow of the boat, a trio of sleek, black footballs appeared. Not quite believing my own eyes, I was nervous as I called it out to the crew: "dead ahead!" We'd had enough false alarms that this still did not feel like a moment to celebrate. But there they were again. And again! And now off the port side, and again at 3 o'clock on starboard! At least 10 porpoises were surrounding us, showing off, even reveling in the attention. And this is when the gasps came fast and loud. The porpoises came closer, swam away, returned again. Oohs from one side of the boat, aahs from the other. And then to cap it all off, just as we thought we couldn't be more surprised, a harbor seal surfaced feet from the bow, opened its giant, shiny eyes and look right at us. It paused, looked, and then made a slow circle of the boat, almost as if to be sure to say hello to everyone on the trip. I swear that seal looked me right in the eye. Saturday was my first day back working at Save The Harbor since the fall and it was great seeing everyone at Save The Harbor again, as well as getting to spend some time with the eager Harbor fans. Even though it was one of the coldest days of the month, many people still came out to join us in the mammal hunt, which was very cool. I am also pleased to say I was once again able to experience something new, for the first time I was able to see a seal and a porpoise in the ocean. I was also able to connect with a couple of young observers which was very cool. That day we conducted three different mammal hunts however the last one was by far the most action packed. In just the last 15 minutes of the last trip I spotted a seal and about 3 porpoise. The mammal safari hunt turned out to be way more exciting than I thought, I'm pretty sure everyone on the boat felt the same way, just by seeing their expression after seeing a seal or porpoise. A beautiful but foggy day on the harbor. 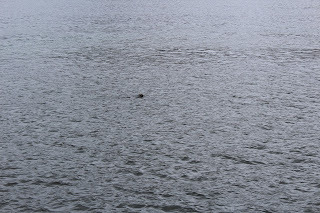 A porpoise sticking out of the water. After months without fish printing, I finally got to do it again with a bunch of awesome kids and it was pretty exciting. Seeing their reactions to the fish when they first came in reminded me of this past summer and it was really funny. They'd ask all types of questions like "is that a real fish?" "where did you get it?" "can I touch it?" It was nice to see how interested they were in learning about the flounders and all the other fishes that we used for fish printing, I also remembered some things that I had forgotten from the summer about the fish. All of them made different colored fish prints that looked really cool when we laid them all out to dry. Seeing how excited they were to show they're mom or dad what they made put a smile on my face. Aside from the fun fish printing, I also got to meet Larry the Lobster! This past summer I only really got to hold crabs, and fish so it was my first time holding a Lobster and it was really cool! We also learned a lot of interesting facts about Larry and we taught it to the kids who were eagerly in line to pet Larry and introduce themselves. Overall it was a really fun and exciting day for everyone and it went by so fast! I can't wait for this summer to come to hang out with these awesome kids again! Today was my first day since August that I was able to see some of my friends from work and I was really excited about that. Besides that, I was finally able to do some of the activities that I have not done in a while such as bonding with kids, fishing and fish printing. I will admit that it was pretty chilly on Atlantic wharf but at least the sun was shining. The kids really enjoyed the fishing and they could not get over the fact that people actually caught fish with other fish. I guess I never really thought of that and it doesn’t make much sense. Either way it is nice to see city kids doing things like fishing since they probably don’t get the opportunity very often. When I was finally able to go inside I assisted on the fish printing and the kids were fascinated by the dead fish on the table. My friend Preston and I decided to play a game of tic-tac-toe at one of the tables and I lost very quickly. A little boy saw us playing and his mom told us that he was a tic-tac-toe master. He was actually really good and he had a ton of moves. I was upset because the day went by so quick but it was fun to hang out with some energetic kids for the first time since last summer. I can’t wait for work to start again in July! Free Marine Mammal Safaris and Arts at Atlantic Wharf during April Vacation Week! Looking for free, fun things to do with your friends, family, kids or group during vacation week? Marine Mammal Safaris are back! 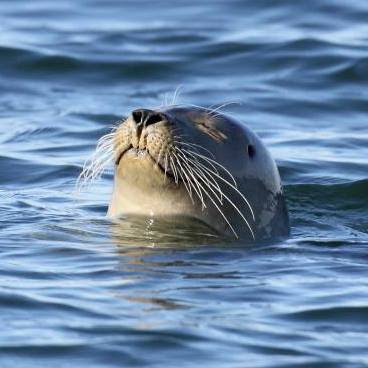 On Saturday April 22, 2017, Save the Harbor/Save the Bay and Massachusetts Bay Lines will host 3 free Marine Mammal Safaris to search for seals and porpoises and share songs and stories of Boston Harbor and the sea. These free trips are open to the public. We welcome school and community groups, youth organizations, friends, families, and children under the supervision of a parent, guardian, or chaperone. The 3rd trip boards at 1:15pm, departs at 1:30, and returns by 3:00pm. These cruises are free but space is limited, so reservations are required. To reserve your spot please email Amy at gaylord@savetheharbor.org. Please specify how many people in your group, a name for the reservation, and which cruise you would like to go on! We suggest you wear warm clothing, and bring a camera or binoculars. Snacks and beverages may be purchased aboard the boat, but you are also welcome to bring your own brown bag lunch. 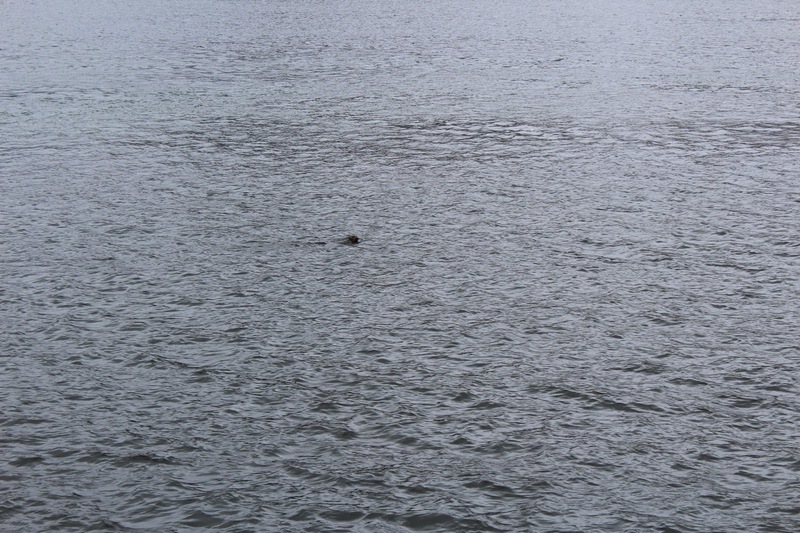 Check out our blog for seal photos taken from the Boston Fish Pier this winter and spring! A very special thank you to our Youth and Family Program Funders and Massachusetts Bay Lines for their generous support of this event! On Tuesday, April 18th, join us at Atlantic Wharf from 11:30 am - 1:30 pm for fish printing with Save the Harbor's Artist in Residence, Olga Karyakina, and Fishing 101 (weather permitting). On Wednesday, April 19th, join us at Atlantic Wharf from 11:30 am - 1:30 pm for Storytelling by the Sea with storyteller Tony Toledo, and fish printing with Save the Harbor's Artist in Residence, Olga Karyakina. Please RSVP for these free programs to Amy at gaylord@savetheharbor.org. Space is limited, and reservations are required. Please include a name for the reservation and how many children and adults in your group! Thank you to Boston Properties - Atlantic Wharf for their support of these programs! All of us at Save the Harbor/Save the Bay are looking forward to seeing you on the harbor, the shore, the beach and the islands this year! 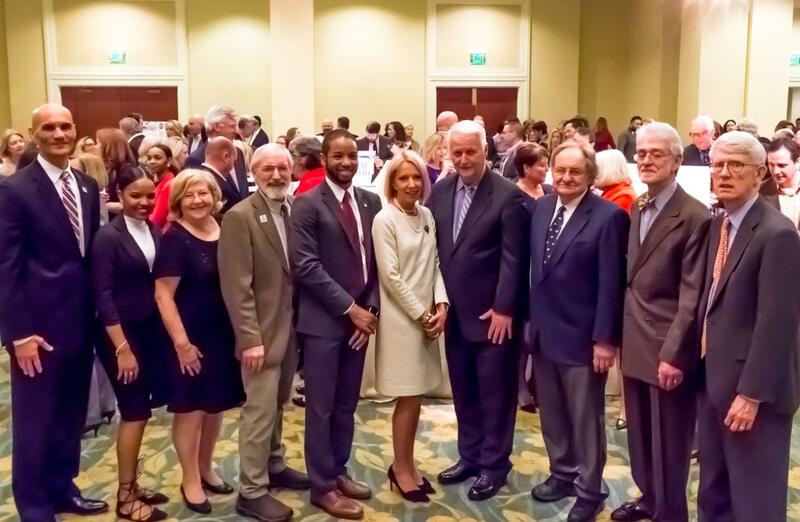 Last week, over 400 Massachusetts corporate and civic leaders, elected officials, and community partners came together to recognize this year’s Boston Harbor Heroes at Save the Harbor/Save the Bay’s annual gala Destination Boston Harbor. The event recognized eight Boston Harbor Heroes, a collection of distinguished men and women who have proven their extraordinary commitment to the restoration and protection of Boston Harbor, our waterfront, and the metropolitan region’s public beaches from Nahant to Nantasket, through environmental impacts, economic drivers, or community involvement. Joe Newman, Chairman of the Board of Directors of Save the Harbor/Save the Bay presented the awards. 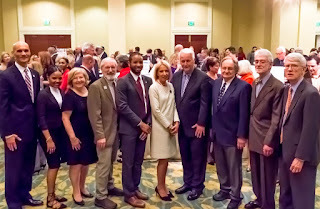 From left to right: James O’S Morton, Andrea Lopes, Barbara Bishop, Charlie Tyner, Austin Blackmon, Sharon McNally, Bill Delahunt, Tom Kershaw, Joe Savage, and Tom Glynn. Barbara Bishop, Metropolitan Beaches Commissioner, along with the many friends of Winthrop’s beaches. Lieutenant Governor Karyn Polito, Speaker of the House Robert DeLeo, Representative RoseLee Vincent, also attended to recognize this year’s Boston Harbor Heroes. Save the Harbor/Save the Bay is a non-profit, public interest harbor advocacy organization whose mission is to restore and protect Boston Harbor, Massachusetts Bay, and the marine environment and share them with the public for all to enjoy. Every year, their Destination Boston Harbor event raises critical funds to support their free youth environmental education and family programs which has connected 160,000 underserved young people and their families to Boston Harbor and the Boston Harbor Islands in 2016 since the program began. You can read more about Save the Harbor/Save the Bay’s Youth Environmental Education Program here: http://savetheharbor.org/Content/2016YouthReport.pdf, and see the full list of all past Boston Harbor Heroes here: http://www.savetheharbor.org/Content/heroes/.